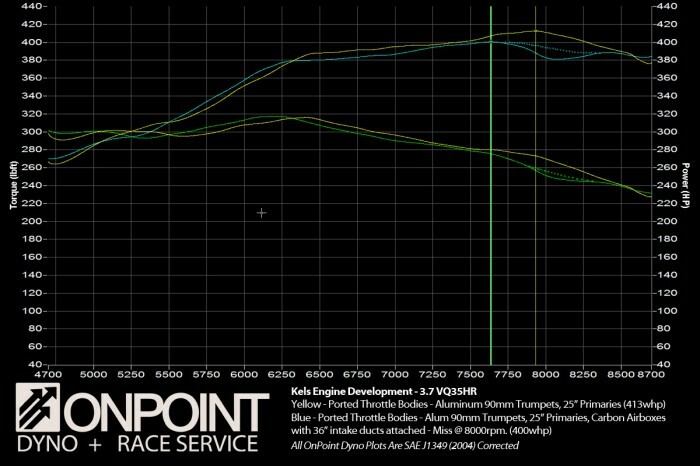 I spent my entire day yesterday working on the dyno with the Z working on making some more power with intake and exhaust tuning. I had help from some good friends, and it was a fun and educational day. As most of you know, intake and exhaust tuning is half basic theory, and half very, very complicated science. 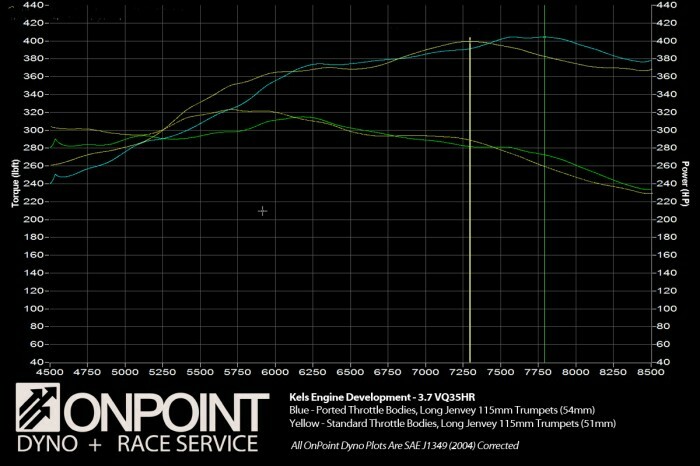 Since building the 3.7L engine I’ve noticed the engine has a great deal of torque, a little bit lower than the power-band I operate in, and the goal was to shift the peak torque up to around 6500-6600rpm, and hope to make peak power somewhere around 8000rpm. Clark and Jim from JWT have been extremely helpful as usual, and the guys down there were nice enough to print me some new trumpets using their 3D printer (very cool!) that we could test. 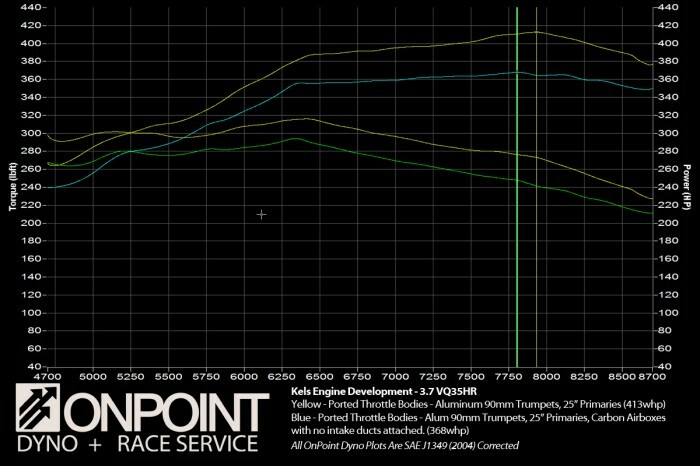 In addition to that, I had Gord Bush port the Jenvey throttle bodies from 51 to 54mm, so we wanted to see what kind of gains were on the table from that. We have also finished some carbon airboxes for the car that needed testing. As if all of that wasn’t enough – I also wanted to shorten the header as I believed it was too long for the 9000rpm we are now running. The story below is quite long – and if you just want to see pretty pictures and hear loud noises, I encourage you to watch the video here instead. If you’re more interested in the step by step techy stuff – watch the video anyways, and then read below! You can see the gains from porting the throttles. 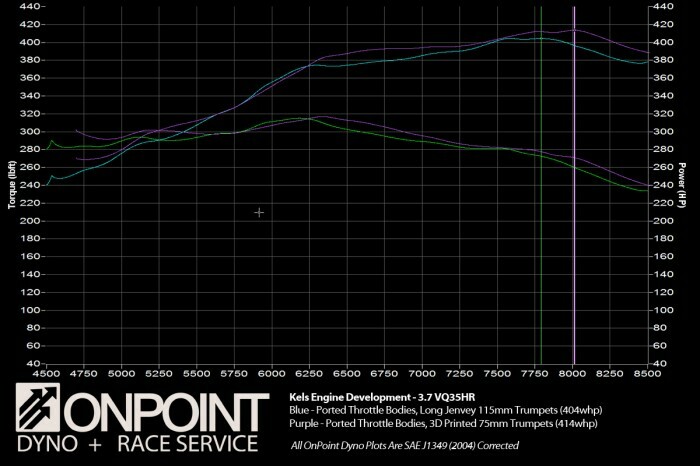 Power has moved over to the right, sacrificing power below 6000rpm, which is fine as the engine never runs that low anymore! You can see that the 75mm trumpets hardly lose power anywhere! So far we were looking pretty good. It’s at this point when things started to get a little bit crazy. The first issue we had was a faulty TPS sensor. 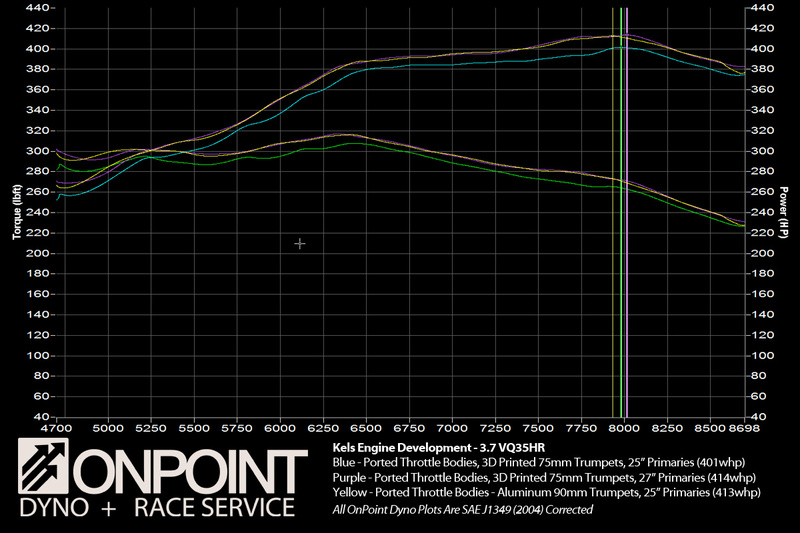 As the engine is tuned entirely by throttle position, losing that sensor is game over. The problem we were experiencing was during full throttle pulls the TPS signal was dropping out – from 100% down to 80%. I believe the vibration at high engine speed has caused the sensor to fail. We put some plastic behind the sensor in an attempt to reduce the transmission of those vibrations, and I also re-scaled the Motec to assume the engine was always at full throttle anywhere past 60% or so. This way even some minor voltage fluctuations wouldn’t affect the fuelling and ignition timing of the engine. Wow! We killed it, and not in a good way. 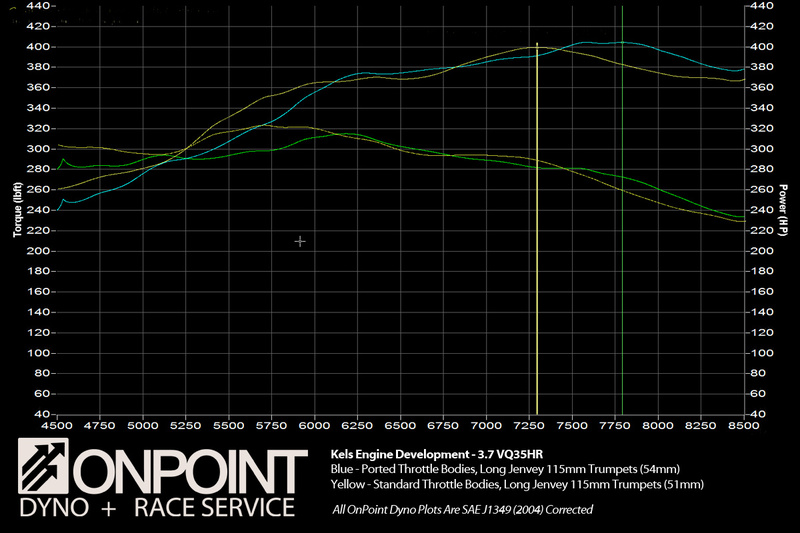 It seems shortening both the intake and exhaust killed the engine’s airflow across the board. 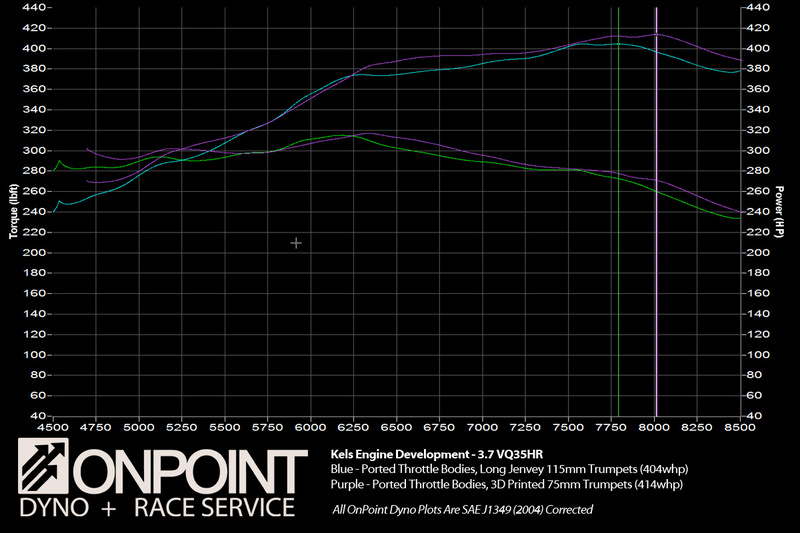 Isn’t it interesting how the graph overlays PERFECTLY considering the drastically different trumpets and primary length? That blew me away. I am starting to think that the overall length of the intake and exhaust systems combined may be an interesting value to record and keep track of for various engines. It seems the engine doesn’t care if we remove a bit from the exhaust if we add it to the intake. Oops. I killed it again. Scroll down, it’s not a sad ending. Needless to say, the hose length feeding the airboxes is critical. Unfortunately, during the lid of one of the airboxes came loose and we had a miss at 8000rpm from the throttle position sensor problem. I believe this is the cause of the dip at 8000rpm, but of course I can’t be sure until we get back on the dyno for more testing. 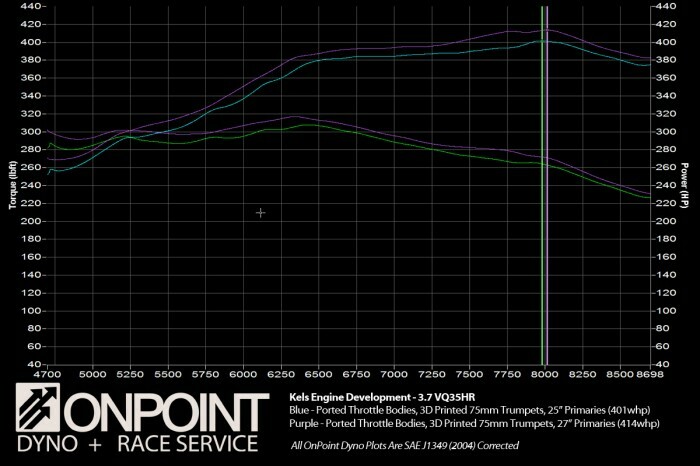 It would stand to reason that tuning the length of the inlet hose to the airboxes will affect the power – as you can see the torque peak moved to the left after the addition of the airbox and intake hose. I think it’s safe to say that this engine is getting quite complicated, and my biggest fear is how I will test each component each time I make a change with the car. Different cams? Should we try different intake length? Header length? 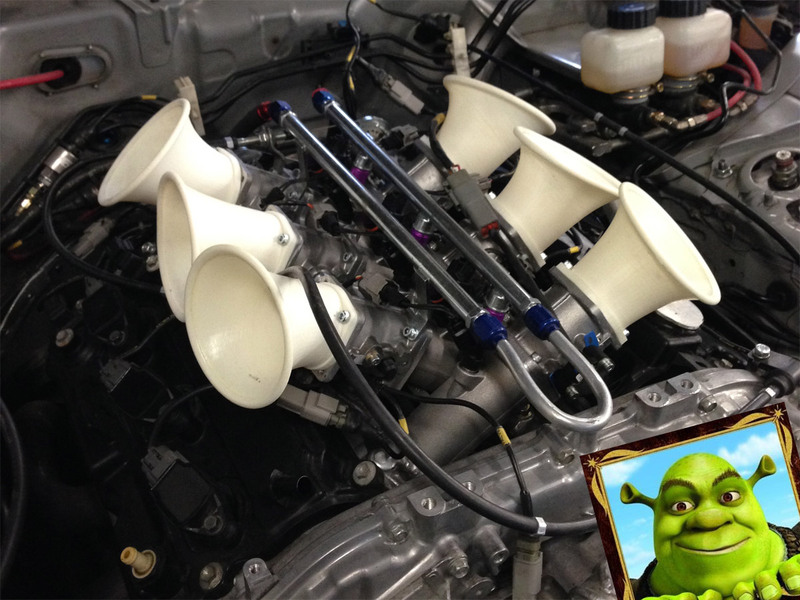 Airbox inlet length? Y-Pipe length? Needless to say… you could go in circles forever. 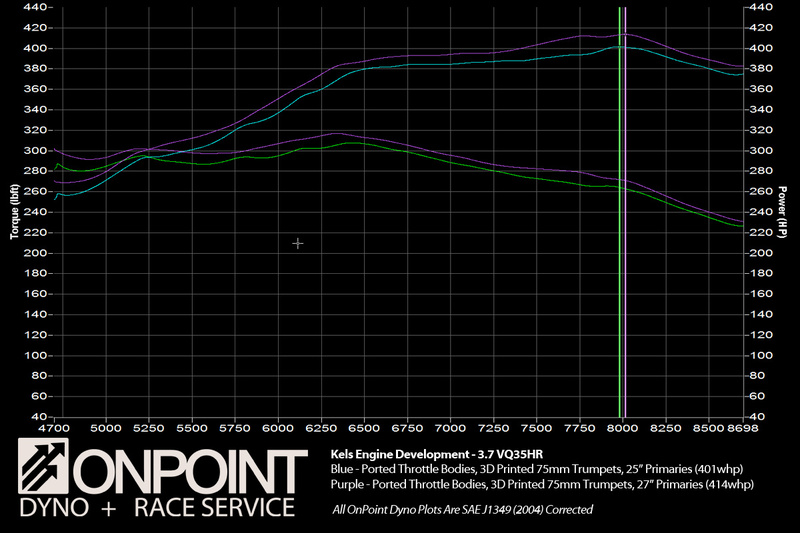 The good news is that we now have a REAL 400whp (if not better) – with the airboxes. 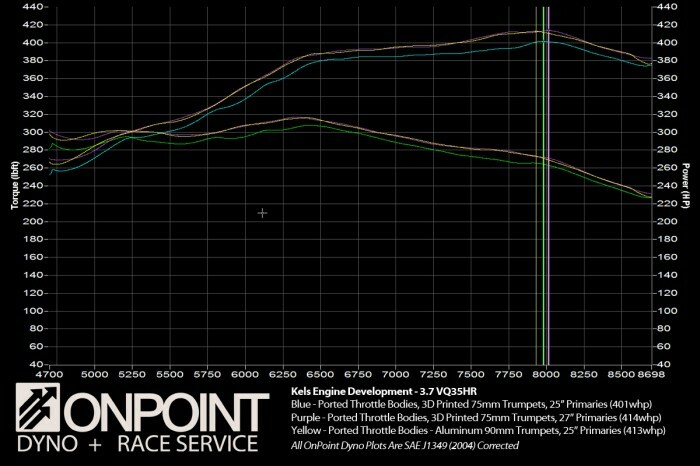 That is a 25whp gain from how the car ran last year, as with the hood closed the 400whp engine was really only producing 375whp. 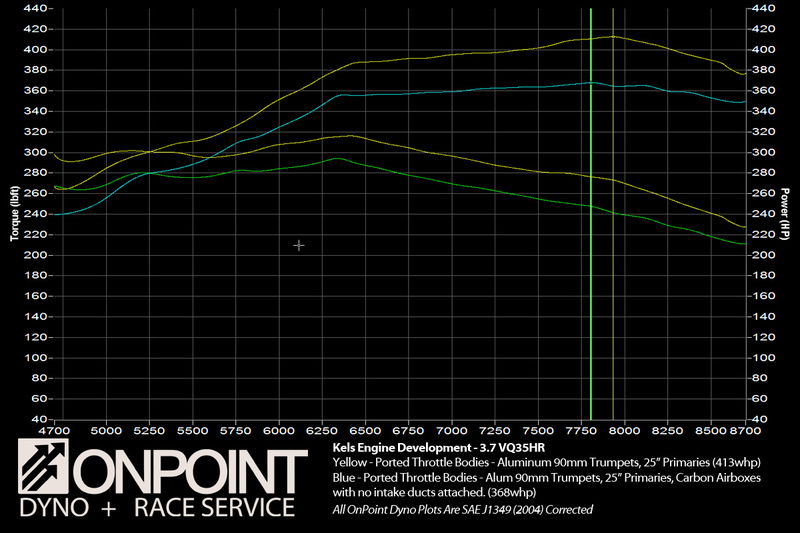 I am confident with more tuning we will be able to improve on that number even more.